QUESTION: Can I apply to more than one programme during the same Call for Application? ANSWER: Yes, you can apply for an EMJMD scholarship to any of the Erasmus+ Erasmus Mundus courses of their choice (see the EMJMD catalogue website available under the following link: http://eacea.ec.europa.eu/erasmus-plus/library/emjmd-catalogue_en ) but for a given academic year the number of applications must be limited to maximum three different joint programmes per applicant. QUESTION: Which documents are needed for the application to the REM programme? QUESTION: Which is the aim of requesting a motivation letter? ANSWER: An applicant must show evidence of maturity, stability, adaptability, self-discipline and strong academic motivation. This can be achieved by providing a letter setting out the reasons he/she is motivated to participate in the programme. Relevance of work experience and future career objectives, as well as additional information provided by the mentor will also be taken into consideration by the JPB for reaching a final decision. QUESTION: Can I upload my ID/passport as a Proof of place of residence? ANSWER: No, the “proof of place of residence” is a document that provides formal evidence that the student has carried out his/her main activity (studies, work, etc.) for more than a total of 12 months over the last five years in this country, which cannot be certified through the ID/passaport. QUESTION: When should I receive the notification of acceptance/rejection to the programme and/or scholarships attribution? Can I appeal the decision in case I are not happy with it? Which is the deadline? ANSWER: The JPB shall complete the selection of students for enrolment on the Programme by beginning of April in each year. The students selected must have the original supporting documentation listed in the application requirements. Unsuccessful applicants to REM master degree on appeal procedure following the rejection of their application (including both selection to the EMJMD and scholarships that were attributed at the time of selection). The appeal must be submitted within seven (7) working days following the publication of selection outcome and/or consortium scholarships attribution decisions. QUESTION: I am a not EU student, can I benefit from EM scholarships? Programme country students: Students from the 28 EU Member States, Iceland, Liechtenstein Macedonia, Norway or Turkey. Partner country students: Students from any other country, provided they are not currently residents of these eligible countries (above), nor have carried out their main activity (studies, work, etc.) for more than a total of 12 months over the last five years in one of these countries. More details about participating countries in ERASMUS + web page. QUESTION: I wish to enroll in your Programme but I don’t have the economic support to finance this period of study, so what are my options? ANSWER: Applying to REM Joint Master Degree will means applying to scholarships managed by the Erasmus+ EMJMD, prior to the deadline established (15th March), being a very generous support that can virtually finance any expenses (including costs of living and travel expenses) during your 2-years Master’s Degree enrollment. You’ll be informed of scholarship award at the same time as the selection outcome and given time to decide if you wish to enroll given the level of financial support offered. QUESTION: Do I need to submit additional / separate application to be considered for a scholarship? ANSWER: No, your online application to REM will be used to award Erasmus+ EMJMD scholarships during the period of study if the application form is submitted prior the deadline of 15th March. Scholarships attribution will be communicated at the same time as the outcome of the selection process. Time enough will be given to applicants to confirm / choose between degrees in the light of the scholarship award. However, there is a number of scholarships programmes (bilateral, multilateral) you may be eligible for. We encourage you to look for such opportunities, which can complement the financial support you’ll may receive from us. We’ll provide any needed supporting documentation but applications to such programmes are your own responsibility and procedure differs between programmes. QUESTION: I’m still a little unsure about the costs the EMJMD scholarship will cover. Will I have to pay for the housing on my own or will that be included in the tuition fee? Will the scholarship cover everything from tuition, housing, and general living expenses or is there anything I will have to pay for now or later on my own? Will I receive part of the Mundus Travel Grant while I’m still at home (3rd) country in order to buy the flight ticket to Glasgow? ANSWER: Erasmus Mundus Scholarship holders receive a monthly allowance to cope with these expenses. They do not have to pay anything to the universities because the participation costs cover tuition fees, field courses, language training, some accommodation and displacements. Erasmus Mundus Scholarship holders also receive travel allowance to cover main mobility (e.g., from/to home; between partners and semester; visa expenses and permit procedures; etc.) and monthly allowance to cover accommodation and maintenance. Travel allowance will be paid once the scholarship holder opens a bank account along September Year 1 (50%) and before September Year 2 (50%). If a payment in advance is needed the REM Secretariat could make a transfer to the home bank of the student (costs are deduced from the scholarship budget) but the promptness of this transfer cannot be secured since it depends on when the budget is received from EACEA, as the money could arrive after the student is travelling to Europe and therefore our advice is to pay in advance and get refunded once the EU bank account is open. QUESTION: Which documents are needed to bring to open bank account to receive Scholarship? ANSWER: If you come from outside EU by plane, please be advised to ask the customs police for an entry stamp in your passport. If you come by another way you have a deadline of 72h to get it in any police station and therefore you can do it directly in the Foreigners’ Police Office at Bilbao, before proceeding with the permits. Appointment in the Foreigners’ Police Office at Bilbao is compulsory. The REM Secretariat will assist you on this. You need one passport photo, an “entry stamp” on your passport and some cash (~20 €) to pay for the procedure fees. Once you obtain the due documents there, you will be able to open a bank account in Bilbao. QUESTION: When in destinations, who should I look in order to help with the procedures? When in Bilbao, as REM Coordinators, Mrs. Pilar Rodriguez REM Secretariat officer (info@maser.rem-eu), will explain to you further details upon your arrival. She will assist all of you during your first week and accompany to the Police Office for visas and to Bank parocedures, etc., if necessary to avoid language problems. QUESTION: Which are the administrative procedures (police permits and bank account issues) required to be done in Bilbao?. Are they compulsory? ANSWER: Students with EM Scholarship can open a bank account in UK upon first arrival (please check conditions for this at UK border). You will receive the monthly allowance and travel expenses there with a cost by the bank transfer (expected 3-5 € per transfer). Then for Semester 2 you can open a bank account in Spain aiming to avoid such bank travel expenses. Third-country students need to obtain a NIE (fiscal identification number for foreigners) at the police office in Bilbao. EU students need to obtain a Registration Certificate (Certificado de registro) also at the Police office in Bilbao. QUESTION: Is it compulsory to open a Spanish bank account to get the EM Scholarship monthly allowance or could I use other EU country bank accounts? ANSWER: If the EM Scholarship monthly allowance is paid in your Spanish bank account this means that you have no cost for this bank transfer and also you can use your card for payments and cash retrieval from some identified cash dispensers without charge, also in UK and France or you can transfer the money every month from another EU account but you would need to pay the transfer fees. QUESTION: I cannot produce, at the time of the online application, results of an internationally recognized English test (TOEFL, …). Does that make me ineligible? ANSWER: An applicant with a mother tongue other than English needs to prove that he/she has sufficient fluency in English. Applicants whose native language is not English is required to pass a recognized international English test such as TOEFL (score 90 IBT), Cambridge Advanced English Test (score B or higher), IELTS (score 6.5 or higher), TOEIC (800) or other English equivalent test. An applicant who carried out his study in English is eligible, passing a recognized test provides him more chance to be accepted (official confirmation letter is needed). The English test result must be sent before the deadline of application. All of this will be established according to our Language Policy. QUESTION: How many specializations are designed and which are their scope in the marine engineering field? Specialization (A): “Renewable Offshore Energy Systems Engineering“. 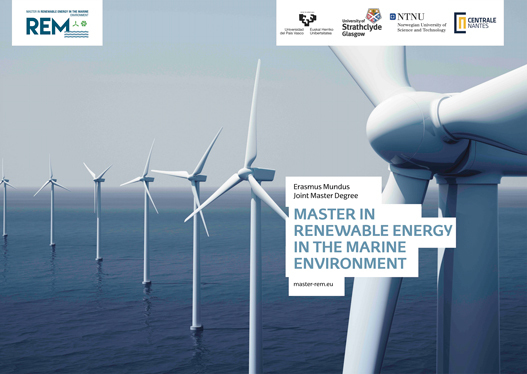 Specialization (B): “Power Electronics and Control for Offshore Renewable Energy Systems“. The first one s suitable for those students with a good engineering and mathematical background, aiming to provide an understanding of the marine energy engineering processes, their assessment and optimization. The second option would be suitable for students with a good electrical-control background, covering aspects related to the power control of marine energy systems. QUESTION: Is the academic calendar already defined at least for this intake? ANSWER: Yes, you can download the academic calendar for this intake HERE although full detailed calendar including all the modules distribution will be available soon. QUESTION: How the progression from one semester to the next is established inside the consortium? QUESTION: Could you please advice about the assessment methodologies to be used in the different modules? ANSWER: To test knowledge and understanding of material presented in the lectures and associated practicals, the student will be assessed via a combination of written examinations, oral presentations, essays, poster presentations, laboratory experiment write-ups, and/or fieldwork reports. QUESTION: Are there language courses offered by the partners of the REM consortium?. What are the costs?